Back to school hit me like a ton of bricks this year! I can’t even begin to describe how tired and drained I’ve been over the last few weeks! Not to mention, changes in my job, a jewelry party at my house, and a few other personal hiccups thrown in, and I left my blog hanging for a while! But, I have some goodies for you for waiting patiently for me to come back! I also have some info on some awesome pens! I’ll warn you now that this is a long post, but keep going! I’ve been in a writing kick lately. I think part of it is because I did a 6+1 traits of writing training a while back for the new teachers in my building. As part of my training, I planned a personal narrative unit that combines introducing the 6+1 traits with the writing process. I’ve been thinking about creating a couple units to sell. I’ve noticed that I think that’s where many people get stuck in writing; how everything fits together. What do you think? Is this something you would purchase? Would you be interested in it? I’d love to hear your thoughts in the comments! Speaking of writing, I’m so excited that Shoplet asked me to review some great office supplies for them! 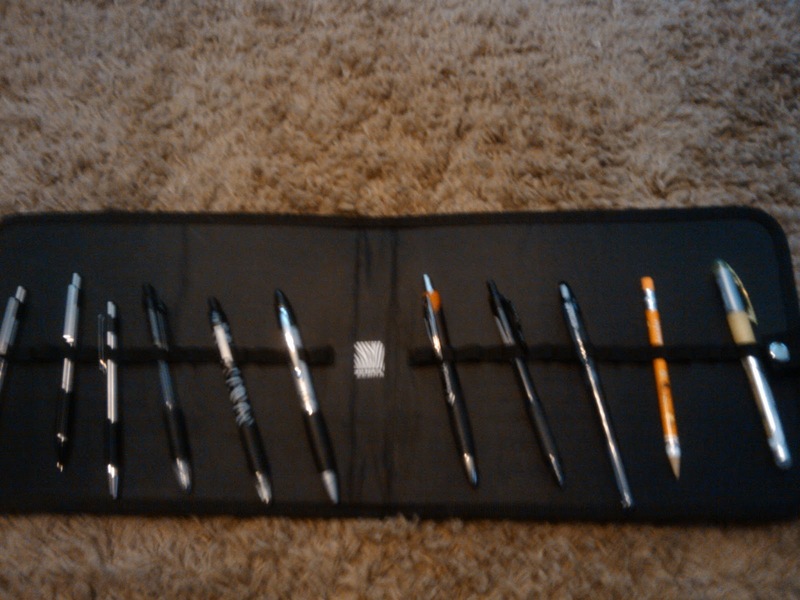 They sent me a variety of pens, pencils, and highlighters from Zebra in this cute carrying case. The first one I tried out is the Z-Mulsion EX ballpoint pen. I LOVED it! It was light and when I wrote and the pen glided across the page. I also really like that the pen is clickable instead of capped- I always lose my caps! Another one I tried out is the M-301 Mechanical pencil. I didn’t love this one, but I figured out it’s simply because of the feel of the pencil itself. There were a couple pens in the same style, and it’s just too skinny and slippery for me. When I wrote, it wrote just fine. However, I just couldn’t get used to the feel of it. Because I had a couple extra to try out, I realized that I love Zebra, just not this particular style. Shoplet is having a great giveaway where you can possibly win your own Zebra Pen and/or a Shoplet.com gift card! Click here to head over there to enter! In my last post I shared some cute back to school stationery. In the meantime, I had started working on a couple different journals. The What If Journal is 35 different pages of “What if…” writing prompts. I like giving students prompts because I think it builds their creative thinking before they do state mandated prompts. I especially like “what if” prompts because it encourages students to think outside the box. You can get the journal from my TpT store by clicking on the pictures above. It’s only $2! I also created a My Wishes Journal. This one also includes 35 pages of writing prompts. It is available for $2 from my TpT store. To get your free copy, click one of the images to come over to my Facebook page and then click on the Fan Only Freebies tab for the download link. I also created and uploaded a yearlong journal resource! My Journal Prompts & Papers unit includes 30 prompts for every school month: August through June. I know 30 is way more than you would need, but I know that students have various experiences and I thought it would be better to give you options. With over 300 prompts, you are sure to find plenty that meet your students’ needs! You can purchase the whole thing from my TpT store for only $3! Just click on any of the pictures. I also put all of that together along with some other writing pieces I had to give you a year-long set for writing. I’m going to use this for my Work on Writing time during Daily 5. Once I started creating the writing pages, I was having a lot of fun and decided to create a bunch. I really liked some of the fall items I had just purchased so I decided to stick with a fall theme. There are 20 free pages in the set! Just click on the image below to download them for yourself! I’m linking them up for a great fall linky. Click the button to check out the other posts! Wow! That was an incredibly long post but I had a lot to make up for! Remember to let me know what you think about my ideas for some writing units! Wow! You were a busy lady! I absolutely love these and they'll be put to good use in any classroom! Thank you for creating these and making some of them available to us for free! I would love to have the free writing pages but I am not able to download them (I live in Korea), is there any way you could email them to me? Please and thank you. If so my email is amerrwet@hotmail.com. Thanks DeAnne. I love that you are a follower of mine! These are so cute Tessa! Thanks for linking up today at TBA!